By Mike Smith: IBF middleweight champion Daniel Jacobs (35-2, 29 KOs) has signed a three-fight deal with Eddie Hearn’s Matchroom Boxing USA DAZN company ahead of his unification fight against WBA/WBC middleweight champion Saul Canelo Alvarez on May 4. Jacobs’ fight with Canelo will be his first fight of a three-fight deal. A third fight between Canelo and Gennady Golovkin wasn’t able to happen right now, since the Kazakhstan fighter still hasn’t found a network platform to sign with. DAZN is the one that most fans believe GGG will ultimately sign with in order to help make the third fight with Canelo. However, what could make it problematic for DAZN to sign Golovkin is the monstrous $365 million contract the company gave to Canelo. With that kind of money going out to just one fighter, it’s hard to imagine that they’ll offer GGG a similar deal. If Golovkin is offered a deal that is just a tiny fraction of the deal that Canelo was given, it could make it difficult to get him to agree to it, even if it’s the best deal offered to him. Canelo vs. Jacobs is coming at a great time for DAZN, as it will help bring them in a lot of subcribers. It’s a much better deal for boxing fans to pay $10 per month to see great fights like Canelo-Jacobs than it would be in the past for them to pay $75 to see a fight like this on pay-per-view. Canelo’s last fight against former WBA World super middleweight champion Rocky Fielding was a poor one. It was not the fight that DAZN needed to bring in the subcribers. Hearn has been banging the drum for a Jacobs vs. Canelo fight for ages now. Hearn finally is getting his way. He’s been saying that Jacobs is the best fighter at 160. This will give Hearn a chance to prove his theory. We already know that Jacobs lost to Gennady Golovkin and Dmitry Pirog in the past, although Hearn thinks he deserved the victory over GGG. Since Hearn isn’t a judge, his opinion about the Golovkin-Jacobs fight is useless. Jacobs can at least now try and prove Hearn right by beating Canelo. If Jacobs wins, then his second fight of his deal will be a rematch. If he loses, then Hearn will likely have him challenging fellow Matchroom stable fighter World Boxing Organization 160 lb champion Demetrius Andrade, who badly needs to start fighting name guys in order to increase interest in his fights on DAZN. 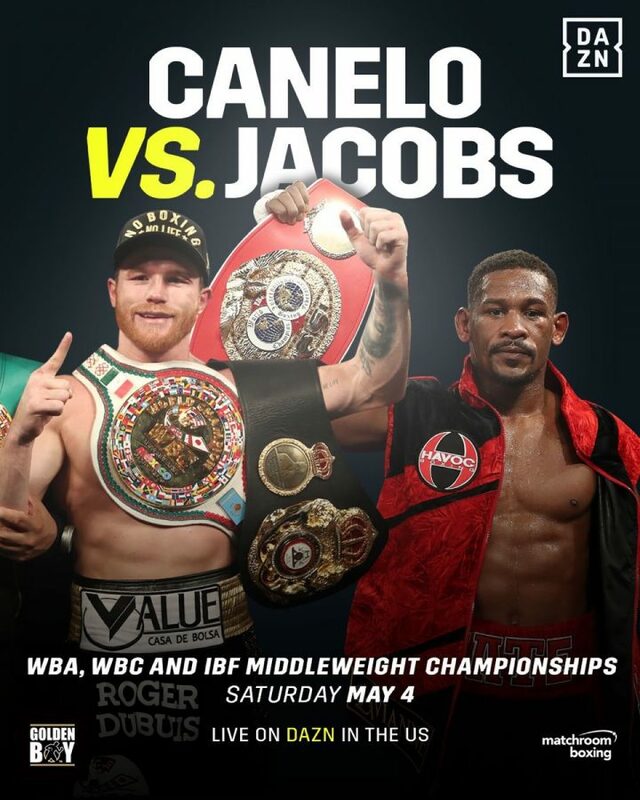 If everything works right for Jacobs, he’ll beat Canelo on May 4, and have three of the four titles in his possession. Jacobs could then have Hearn match him against WBO middleweight champion Demetrius Andrade so that he can unify the division in the entirety. The boxing fans won’t have to pay $75 to see Canelo vs. Jacobs on pay-per-view like they would have in the past when the two were both signed with HBO. That network recently stooped broadcasting boxing after 45 years, and that sent Jacobs and Canelo in another direction towards DAZN. Jacobs is certainly an upgrade from Canelo’s last fight against Rocky Fielding, but you can’t say he’s an improvement over Gennady Golovkin. Some boxing fans are saying on social media that Jacobs is a better fighter than Golovkin, and that Canelo already beat GGG twice. That’s not the case. Canelo has a controversial 12 round decision win over GGG, and a very question draw against him. Jacobs is not an improvement over GGG, and it’s likely there won’t be as much interest in the Canelo-Jacobs fight from the boxing public compared to what would have been had Golden Boy signed a deal with Golovkin for a trilogy fight. Jacobs asked for this fight after he won the vacant International Boxing Federation middleweight title in his last fight against Sergiy Derevyanchenko last October. Canelo and his promoters at Golden Boy Promotions happily accommodated. Now it’s up to Jacobs to prove that he has the talent to beat Canelo. If not, then Jacobs will need to go back to fighting the guys like Luis Arias, Derevyanchenko and Maciej Sulecki, as those are fighters he can beat. Well, De La Hoya is a little off there with him saying that “nobody has to worry about him fighting the best.” Canelo’s last fight against Rocky Fielding clearly wasn’t against the best at super middleweight. That was against what some fans believe was a paper champion. If De La Hoya wanted to put Canelo in with the best at 168, he should have matched him against WBA champion Callum Smith. He’s a fighter that destroyed Fielding in one round in 2015. Canelo did well in fighting Golovkin twice in a row, but before that, he fought Julio Cesar Chavez Jr. and Amir Khan, who weren’t the best. You can say that Canelo fights the best some of the time, but not all the time. Half the time, Canelo is taking soft opposition against guys that are very beatable like Khan, Chavez Jr., Alfredo Angulo, James Kirkland, Shane Mosley and Liam Smith. Canelo’s two fights with GGG were clearly bad for his image, as was his positive test for clenbuterol. What Canelo needs is a decisive win over Jacobs like his last one against Rocky Fielding. That was a great performance by Canelo. Unfortunately, it came against a weak super middleweight that the casual boxing fans have never heard of. Instead of Canelo focusing on collecting titles in different divisions by looking to face weak champions, he should be looking to fight the best in the middleweight division like fighting Jermall Charlo, Demetrius Andrade and Billy Joe Saunders. Jacobs is a good fight, but he’s also someone that lost to GGG, and he hasn’t looked good since that loss.